The Great Western Railway liked to show off its 'new technology', as in the photograph above, but the majority of UK railway companies held back from publicising their breakdown cranes because it could be unwise to suggest the possibility of danger or discomfort in a journey taken by rail. With the breakdown cranes kept mainly behind the scenes, their importance to the operation of the railways was also hidden to an extent. The BDCA aims to give these cranes their rightful place in the annals of railway history and to support the preservation and operation of those that remain. In The Cranes you can browse the history of railway breakdown cranes from the portable hand-operated examples of 150 years ago to the tele-jib cranes of today and follow the advances in their design and development. In this section you will also find short biographies of the major makers and a selection of breakdown crane stories. 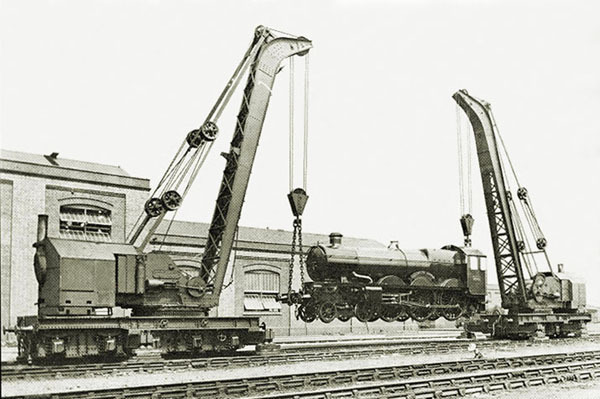 Would you like to know which UK heritage railways have breakdown cranes, when they were built, how much they can lift, and whether or not they are in working order? It's all in the Data Files. The Bibliography can be your guide to further reading about railway breakdown cranes, and the Glossary will explain any breakdown crane terms with which you may not be familiar. Both of these sections will be found within the Data Files. The Forum is the place to announce sightings, ask questions, provide answers or discuss anything at all connected with railway breakdown cranes and recovery work. The Gallery should be visited for its host of pictures of breakdown cranes in their working days and in preservation. Were you involved in any way with breakdown cranes or recovery work on the UK's railways? If so, the BDCA would please ask you to make contact so that we may record and save your experiences for the benefit of future generations. Notification of the most recent updates to the BDCA website will be found in the Forum entitled What's New on the Website?